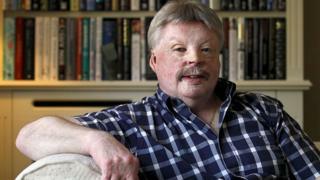 A row after a senior Tory referenced the Falklands War when speaking about Gibraltar is "ludicrous", Falklands veteran Simon Weston has said. Lord Howard faced criticism after he said Theresa May would show the same "resolve" as Margaret Thatcher did over the 1982 conflict. The Lib Dems said he was "sabre-rattling" and Labour criticised the "inflammatory" remarks. But Mr Weston said the row, as Brexit talks loom, was a "storm in a teacup". It was sparked by draft negotiating guidelines published by the EU on Friday that said any decisions affecting Gibraltar would be run past Spain. The country has long contested Britain's 300 year-rule of the territory, which has a population of about 30,000. After Argentina invaded the Falklands in 1982, Margaret Thatcher sent a task force to reclaim the islands in the South Atlantic and an estimated 655 Argentine and 255 British servicemen lost their lives in the fighting that followed. Mr Weston suffered horrific burn injuries when the Sir Galahad ship came under fire in the conflict. The former Welsh Guard said: "There's a huge amount of hysteria going on. "When you listen to what he actually said rather than interpret it... it's a storm in a teacup, we all need to calm down. "People are reacting like this because of Brexit. We're giving more power to the European negotiators by reacting like this and making it seem like we're not all together." Theresa May has said the UK is "committed" to the territory.